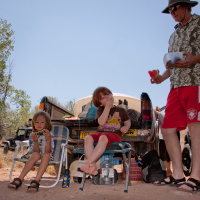 During the first few months of summer my son and I join a group of parents and children every Friday morning under the Highway 14 Bridge, which crosses the Galisteo River. Buckets, shovels, and plastic army men are standard issue for each child. 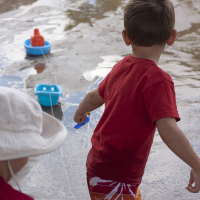 We watch them pushing toy monster trucks over the red-brown dirt and pulling toy boats through the shallow trickles of water that New Mexicans call a river. 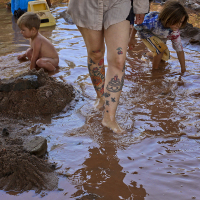 Most of the Galisteo River’s water lies beneath a covering of coarse, red sand, so parents dig trenches to force the wispy streams of water to flow faster and deeper. 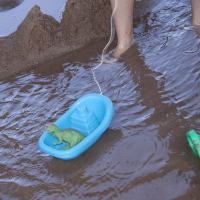 Even the deepest trenches are no higher than the knees of a three-year old and the flow only fast enough to carry a toy boat ten feet or so. 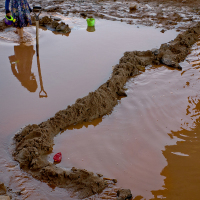 We form dirt piles from the displaced earth supplied by the trenches. 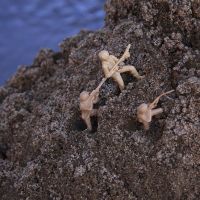 The piles are made for conquering by plastic army men and a naked children. These Friday mornings at the river with our friends have become a cherished diversion from the routine of the rest of the week. 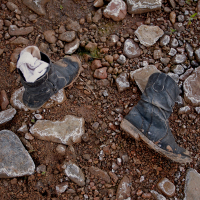 Around lunchtime, we put out lunch, which shifts the children into being still and quiet. 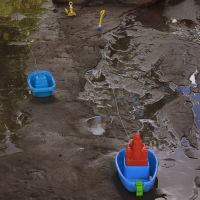 They anchor their boats with nylon fishing lines tied to shovels forced into the mud. They consume strawberries, blueberries, and nuts along with peanut butter and jelly sandwiches. They learn to share because we require that they learn to share. Play resumes for a while. 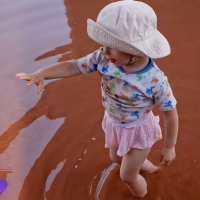 Soon one parent starts to rinse off the mud-encrusted toys, and another starts toweling off a wet body or two. 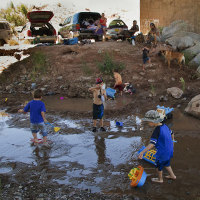 The toys and children are loaded into the hot cars as the day at the river comes to an end. They have expended so much energy that naps are sure to follow the four or more hours of playing outside in the open air. 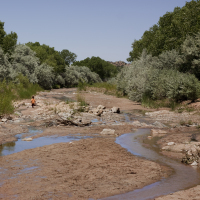 In late July, the monsoon season starts and the Galisteo flows deeper, redder, and swifter. No amount of repellent will stop the hoards of mosquitoes that have invaded the banks. We don’t show up at the agreed upon time anymore because nature has become uncooperative and claims our little piece of paradise as its own until next year.